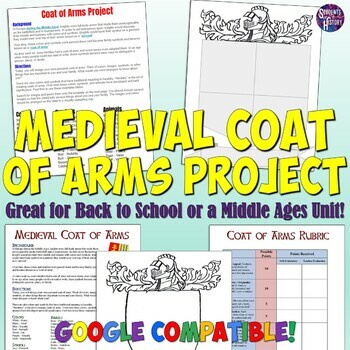 This excellent Coat of Arms project is great for a unit on the Middle Ages or for a back-to-school "get to know each other activity"! Included in your download is a simple directions page for students that provides the historic background of Coats of Arms and heraldry in Europe. It also provides students simple instructions on how to create a Coat of Arms. Next is a fantastic printable Coat of Arms template to use in class and a rubric to help with grading. This is a very fun project that allows students to be creative, while also engaging in history content. I have used it at the beginning of the year as a way to get to know students as well as in the middle of the year during or unit on Medieval Times. These projects always make for excellent classroom decorations before Back to School night! Hope you have a great back to school season!